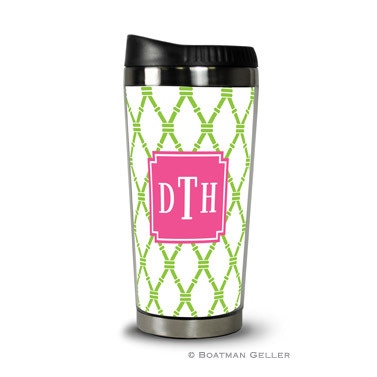 Preppy and personalized – Boatman Geller Travel Tumblers keep your beverages hot and your hands not! Great for your morning coffee & gift giving too! 1. Travel Tumblers may be personalized with up to three lines of your choice. You may choose a monogram on it’s own, a monogram with up to two lines of text underneath or up to three lines of text without a monogram. 6. Select your Inset Style. You may choose the traditional White Inset or the Pre-Set Raspberry Inset.